All is not well in the Human Sphere. The alliance between the Great Powers is starting to fall apart, the human economy cannot keep up with the urgent need for newer and better starships and politicians are demanding an end to military spending. For the Royal Navy, desperately trying to do too many tasks with too few ships, it is the worst possible time for a new threat to appear. ... And a sinister horror beyond human understanding. This is the start of a new story ark in the Ark Royal universe. As such we are introduced to a new ship class, a new captain, crew and showcases it's capabilities. Nuttall delivers a feast for the reader. He sets the scene by describing the stresses the last 2 interstellar wars have had on the great power's economies, the political realities of same and kicks off the book with a bang. Space action, a first contact mission straight from hell with 3 dimensional characters. The epilogue was a particularly nasty twist. My only gripe was Christopher's writing tick, "and yet" and "it was hard, so hard" came up again. "And yet" seems to get a work out as the action picks up. I may have noticed it more with this one because I've read several of Christopher's novels this month. 4.0 out of 5 starsAnother species. Another good read. As human space increases, more alien races are encountered. 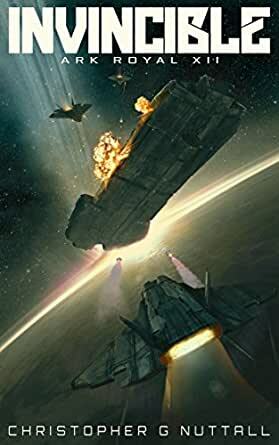 "Invincible" is sent to investigate when a massive colony ship arrives in a distant star system. A terrifying new threat is encountered, but the ship and its crew live up to its name. I've read and enjoyed all of Mr Nuttall's "Ark Royal" series. He's been able to keep the tension going throughout the series. Nuttall consistently expands the universe he’s created by adding new bits on to the old but in a convincing way. The extension of modern tech into the near future and matching it with credible characters makes the whole series of books very satisfying to read. Another great way for you to enjoy your dose of military scifi in this series of future "Hornblower " type action .....with a more malevolent enemy!! Another great story in the Ark Royal series. Keep them coming.